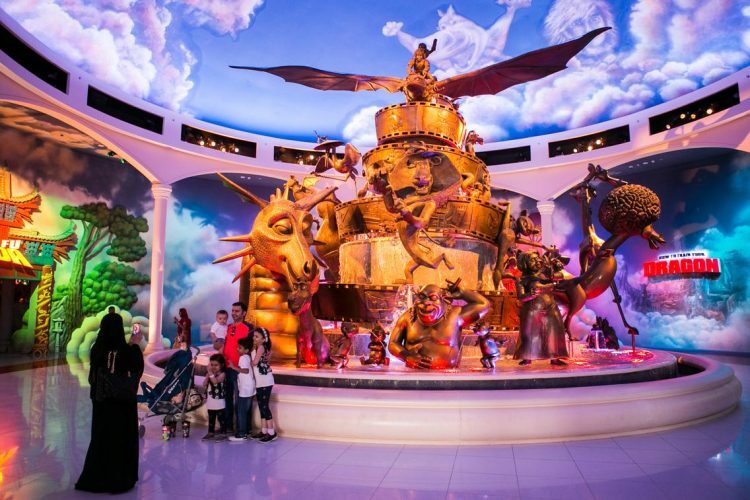 The project called for significant lighting design for dark ride attractions, area development, F+B, Retail and multiple custom light fittings. In co-operation with the Art Direction team of DPR, Smurf style luminaries were created with no visible means of operation as Smurfs didn’t have electricity. 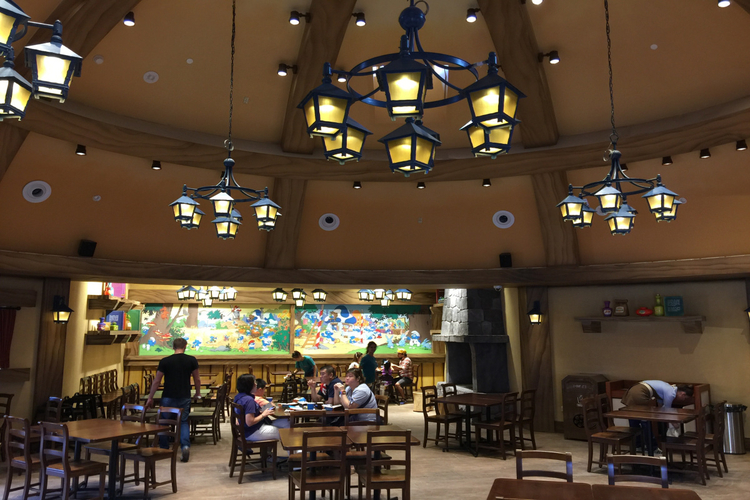 Similarly – custom fittings and flicker lamps were developed to enhance to world of Shrek and Dragon Gliders. Mini track fresnels were developed with DeSisti to complement the CLS Safffire spots used in much of retail outlets. Specifically in Dreamwork’s Animation – the themed areas are based on IP which didn’t evolved from worlds with no electricity : Shrek, Kung Fu Panda, Dragon Gliders. A custom LED flicker lamp was developed to provide chinese lanterns with “candles” and Shrek style lanterns with a candle flicker. Dragon Gliders required a different approach with custom hanging fir baskets using Rosco Miro cubes to look like coals and produce a reflected effect from the canopy. Finally – hand made fireflies suspended from trees in Shrek completed a natural look complementing the IP. 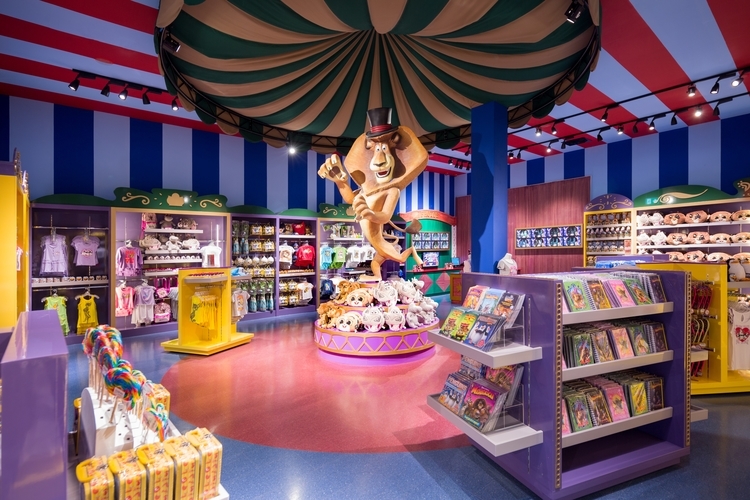 Tied to and 11 month programme to design, produce 870 drawings, procure and deliver ~ 25,000 FOH light fittings for an entire theme park was an immense challenge with ongoing design changes. We developed a bespoke labelling system that generated data from CAD drawings, all luminaries delivered were pre-prepared and labelled according to the drawings with location, type, Unique ID, and power circuit. This made co-ordination with the Electrical Contractor much easier and our QA/QC teams could solve problems proactively. The Area Development (circulation areas) light poles and attraction mounted facade luminaries / decorative fittings utilising retrofit LED lamps were all closely tied to the same colour temperature – working closely with the retail outlets and F+B with large glass windows – a very natural balance of around 3000K was achieved making the park a warm and welcoming space in the evening and night time.